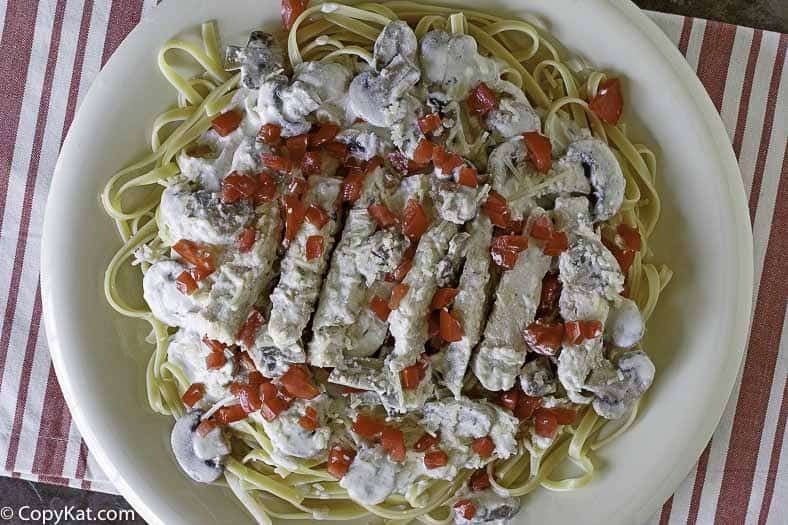 Johnny Carino’s Gorgonzola Chicken has been one of my most requested recipes in recent memory. When we went down to do research for the recipe, it had just been removed from the menu. The folks at Johnny Carino’s were kind enough to prepare the dish anyway! 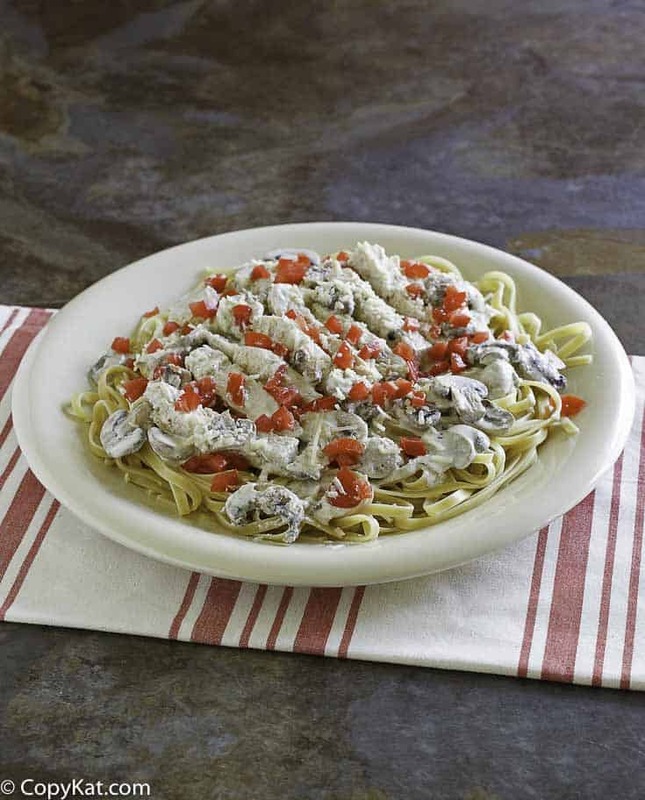 So you might ask yourself what is this Gorgonzola Chicken, it is a rich pasta sauce that is flavored with Gorgonzola cheese, mushrooms, grilled chicken, and fresh chopped tomatoes. Gorgonzola sauce is actually a classic Italian sauce that many people have enjoyed, thanks to the people at Johnny Carino’s this sauce has been introduced to so many of us. If you are looking for a sauce that is creamy like an Alfredo sauce this may be a wonderful sauce for you. This pasta sauce which is made with Gorgonzola cheese has a sophistication that is perfect for when you want something more. 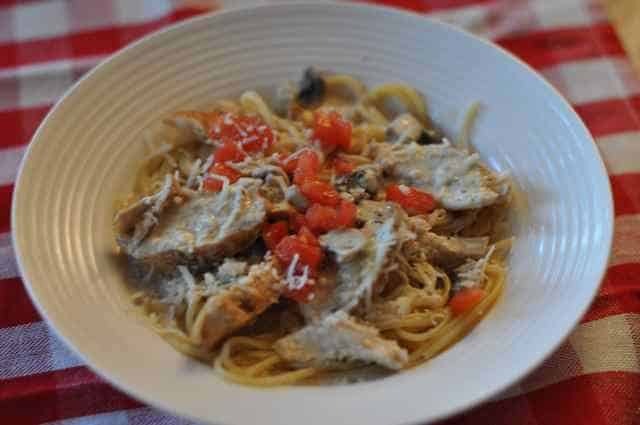 This recipe for Copycat Johnny Carinos Gorgonzola Chicken is no longer on the menu at most of the restaurant locations, but you can recreate this dish at home with this recipe. You can recreate this menu item at home. 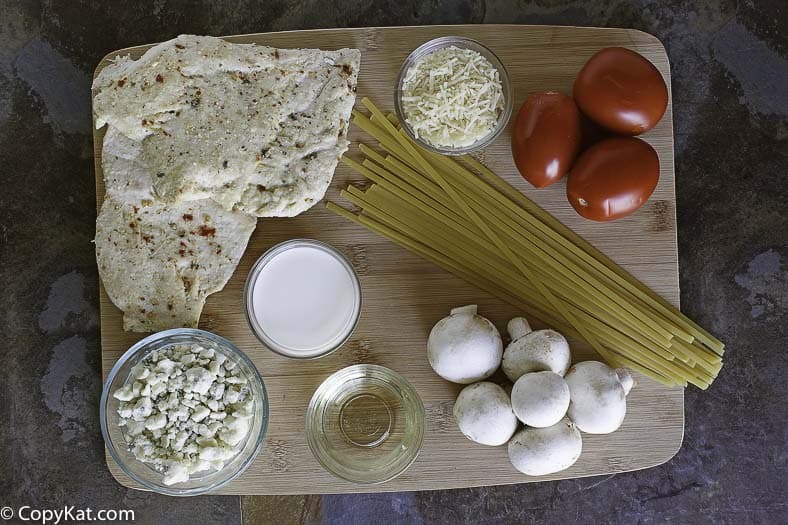 You will need chicken, cream, gorgonzola cheese, mushrooms, fresh tomatoes, and Parmesan cheese. If you have made an Alfredo sauce before you can make Gorgonzola sauce. While this dish may not still be on the menu at most Johnny Carino’s you can make this flavorful pasta sauce. It goes perfectly with fresh grilled chicken and tomatoes. Copycat Johnny Carinos Gorgonzola Chicken is one of the most requested recipes from my viewers. This menu item is no longer available, but you can still make this at home. Pound chicken breasts until they are 1/2 inch thick season with salt and pepper. Sear chicken in a hot skillet with two tablespoons of oil over medium-high heat. Cook on each side for about 4 to 5 minutes or until completely cooked. Remove chicken breasts from heat, and let rest for several minutes before slicing. You may need to add an additional tablespoon of butter or two to the saucepan to saute the mushrooms. Saute the mushrooms on medium-high heat until they are browned. While mushrooms are browning sprinkle with about 1/2 teaspoon of salt. Cook pasta according to instructions on the package. Johnny Carino's typically uses penne pasta, but I like to use a fettuccine pasta because I think it holds the sauce better. Prepare sauce by combining half and half and Gorgonzola in a saucepan heating through. The sauce should thicken slightly. Slice chicken into 1/4 inch slices. Add sauteed mushrooms to the sauce, and stir to combine well. Plate pasta by adding 1/4 of the pasta, 1/4 of the chicken slices. Drizzle with sauce, and top with chopped tomatoes and shredded Parmesan. If you need to reheat this dish, I recommend leaving all of this unassembled and reassemble just before serving again. If you do not combine the pasta sauce and pasta together while this is refrigerated the sauce won't soak into the pasta. It’s missing the bacon and sun-dried tomatoes. At least the one I’ve had at Carino’s in Houston and Baton Rouge locations have this. So just made it, I LOVE IT! <3 Thank you for sharing this recipe! I used Penne Rigate pasta, since the ‘ridges’ and the ‘tube’ of the pasta held the sauce very well. I didn’t miss adding salt, since parmesan cheese is already salty. I did however, add a ‘scant’ sprinkle of garlic powder into the sauce. (Pepper was NOT missed in this dish.) I topped this dish off with a bit of finely chopped Italian parsley (sprinkled over the chopped tomatoes and the grated parmesan cheese.) I doubled the recipe, since I served it at a small dinner party. Everyone raved about it, and I loved it, as well. I am glad to hear you enjoyed this recipe a great deal. I appreciate your refinements for your dinner party. I am happy to hear everyone enjoyed the dish. I am pretty certain you won’t respond, but I can’t tell if you made the recipe and thought it was horrific, or if you didn’t like how the recipe was written. I appreciate your passion, but I am curious as if you even made the recipe. Your recipe sounds delicious, also, the “add ins” suggested by other people. Why do some people have to go out of their way to say something nasty, Not Happening, I’m talking to you! You don’t like the ingredients, move on by!! Don’t make it. Don’t use this site. Why be nasty? I think people do this online because they feel they are powerful when they do this online. I have my doubts if the folks have even prepared the recipe. TO: “Not Happening”: You’re obviously one of those readers who’ll criticize a recipe even before trying it. If you actually knew anything about Italian cooking, you’d already know that Gorgonzola contains a LOT of flavor, so you might not (even) need to add additional salt, pepper, and garlic. You should definitely make the recipe before you criticize it! Shame on you, as you’ve now demonstrated that you don’t really know as much about Italian cooking as you’d like us to believe that you do. It’s a very nice recipe. I used Trader Joe’s gorgonzola and easily crumbled it up to make a nice smooth sauce. I also used brown rice pasta and found that the texture was very good for this recipe. This was awesome. I will be doubling the recipe next time so I can have leftovers. Also, we added onions, sweet red pepper, 4 cloves of garlic, and white wine to the sauce. Delicious. Three words: delicious, delicious, delicious. Definitely making this again. One suggestion: you can use more cream to make more sauce and soak it up with some nice toasted bread. Hmmmm! I didn’t have gorgonzola, but I used blue cheese, it was a little milder, but I enjoyed it just the same. Thanks! Guess what I am making tonight???? ?